Not only is that a title to a song by Phil Vassar (which is one of our theme songs and has nothing to do with the Big Island), but the title is a true statement. 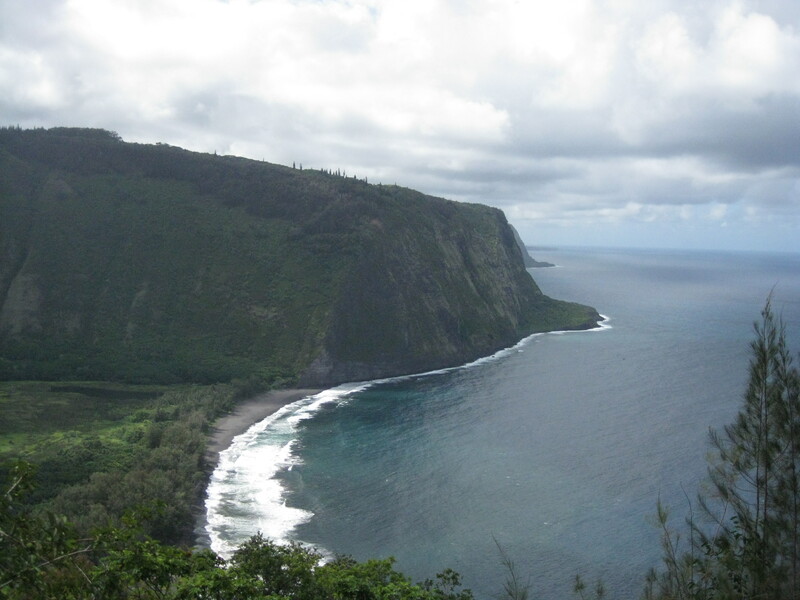 Being here in Hawaii is like living every day in paradise. There is such a perfect mix of daily rain and sun over on the eastern side of the island. Just the other morning, I enjoyed a quiet cup of coffee with a lush view of a backyard rainforest and an hour long symphony courtesy of the raindrops on the roof. It was a perfect start to another day! We are really packing it in during the days. There seems to be a LOT to see and do and just not enough time to do it. Carl has made a map from google with stars on the spots we don’t want to miss…if you zoom out, it looks like the entire island is just a bunch of gold stars! 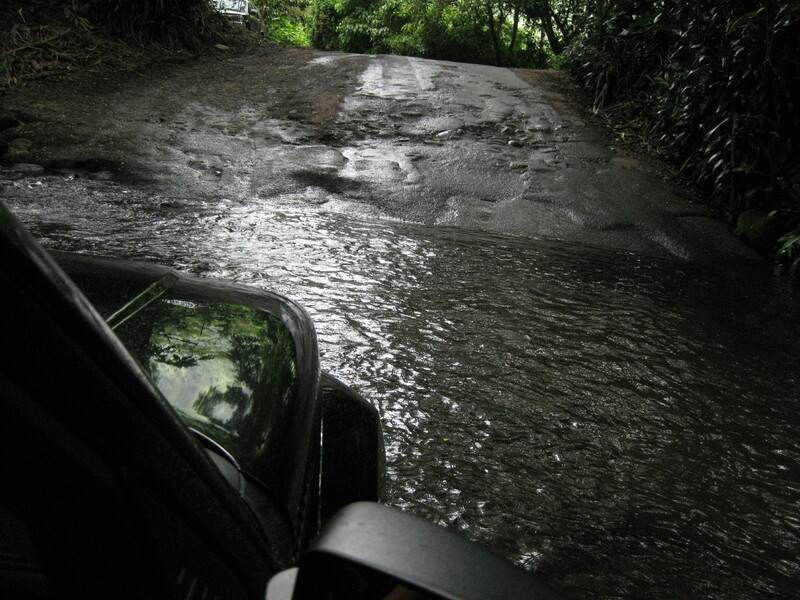 This is Carls favorite kind of road….one with a 25% grade!! The path down to the Valley of the Kings was scary and fun….we got to drive through some beautiful scenery we wouldn’t have been able to see if we had stayed on the top part! We quickly realized that we should pack lunches everyday in our cooler and then make dinner at home. While here, we’ve tried to experiment and stretch our boundaries a bit. One thing we tried was something called a musubi. 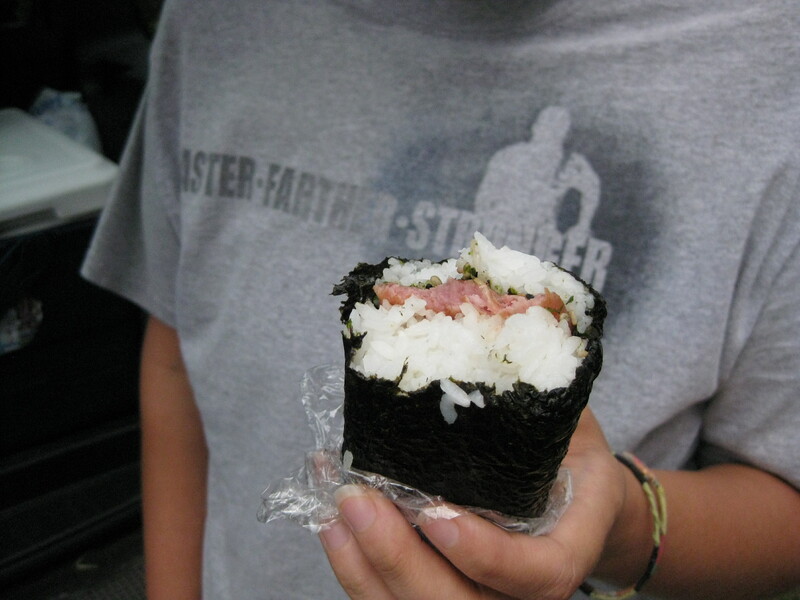 Musubi’s are a sushi like Hawaiian snack of ”stuff” inside a block of rice and wrapped in seaweed. The ”stuff” can be a myriad of things, however, we tried Spam (see….it’s everywhere!). It was actually pretty good! A bit too much rice for me but a cheap and easy way to fill a Travelling Awesomes belly! We also tried something that…well…I have no idea what it was. It was some kind of rice with a pink slimy substance wrapped in a banana leaf. 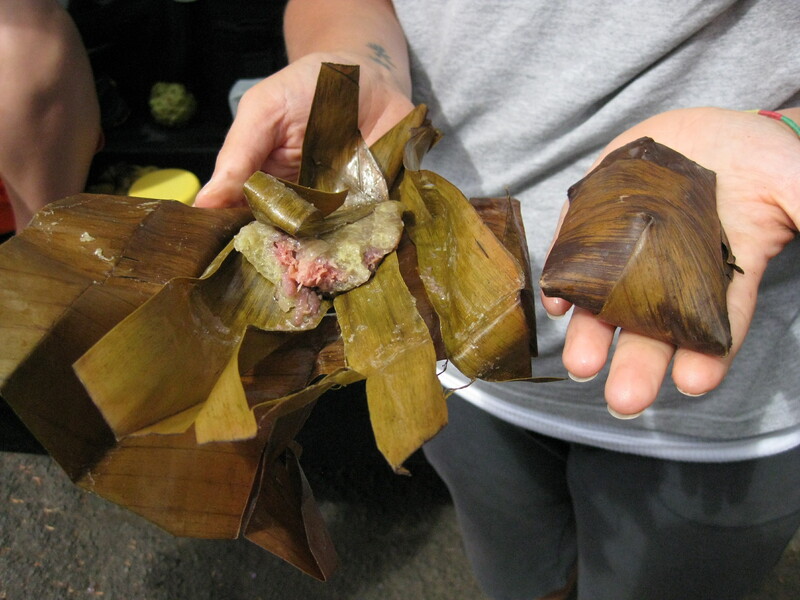 I’m not so sure any of us will try anything wrapped in a banana leaf for a while…it wasn’t terribly appetizing! 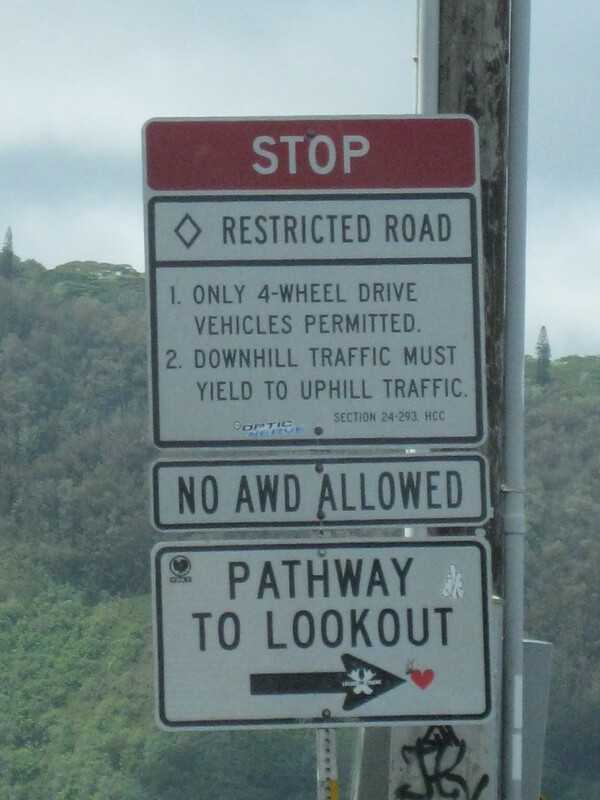 Up next was a drive to the Lava Tree State Park. 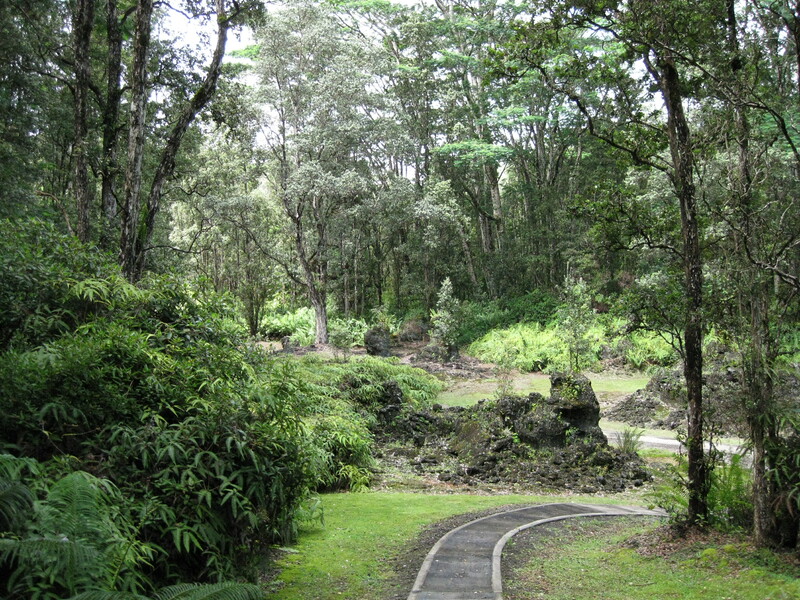 Lava trees formed when fast flowing lava runs into wet ohi’a trees. As the flow keeps going it leaves a thick coating around the tree (which is dying). 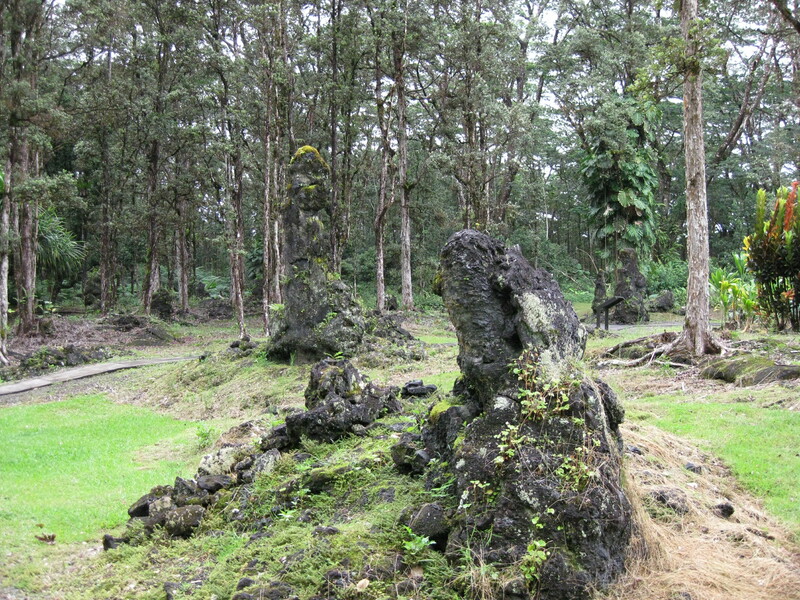 After it’s all said and done there are these big piles of lava rock in the shape of tree trunks. It was pretty neat. 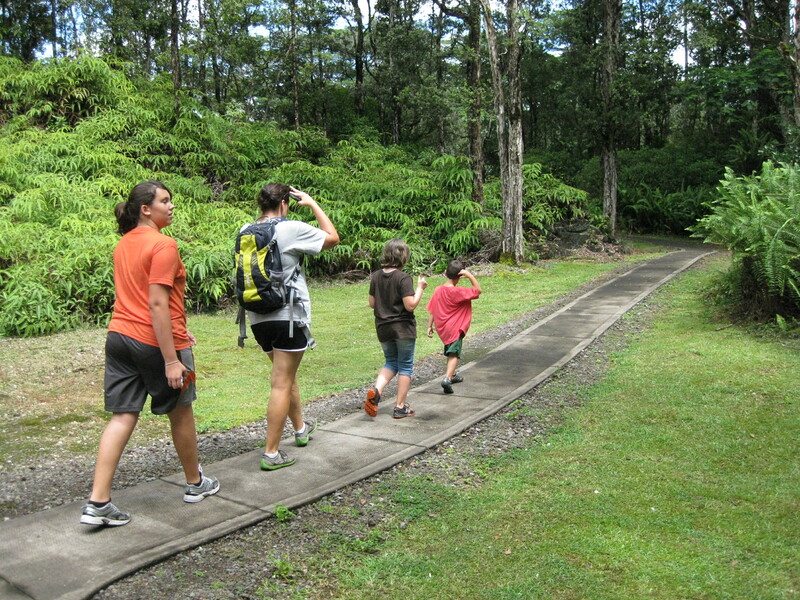 We all enjoyed the short hike through the park looking at the trees and the various flora and fauna we found there. 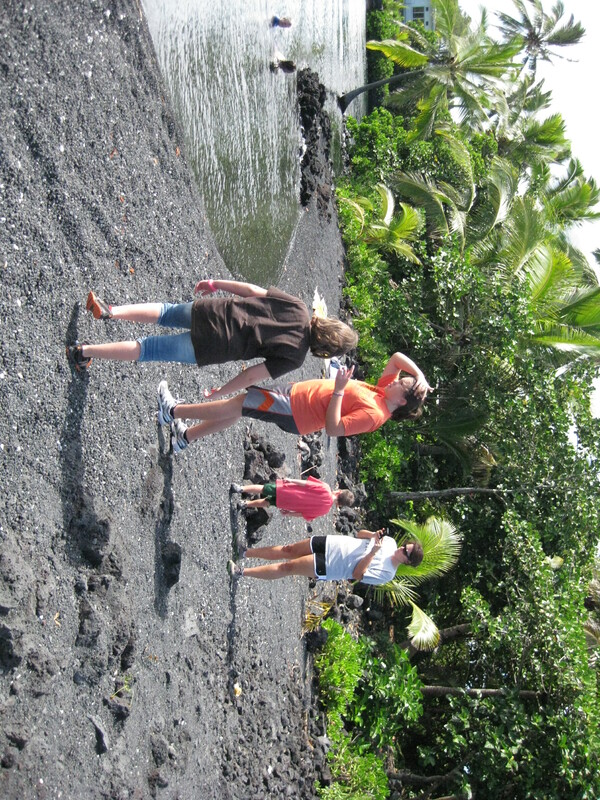 After the park we went on another 4wd trek, only this time it was through a lava field! 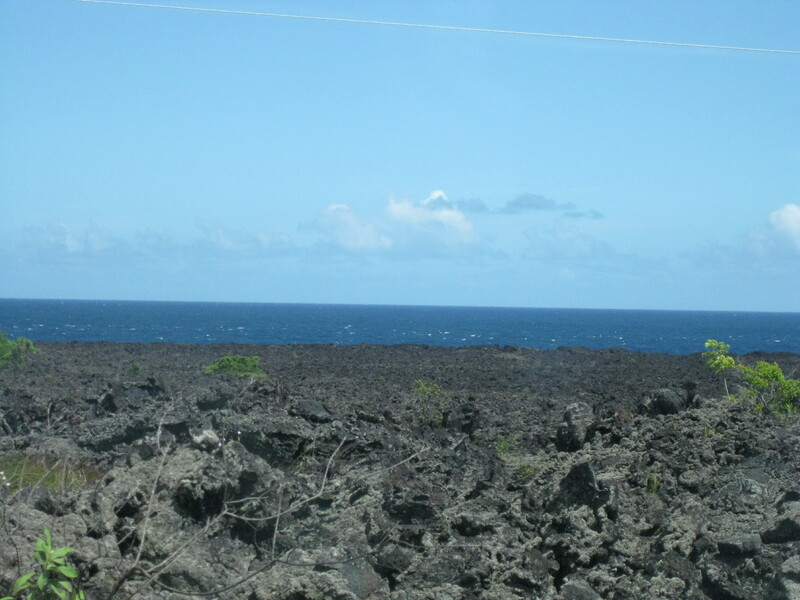 At the end of highway 132 is a field of lava dating back from a flow in 1960. Mountains of lava that measured 3/10 of a mile high produced so much lava that it wiped out an entire town. 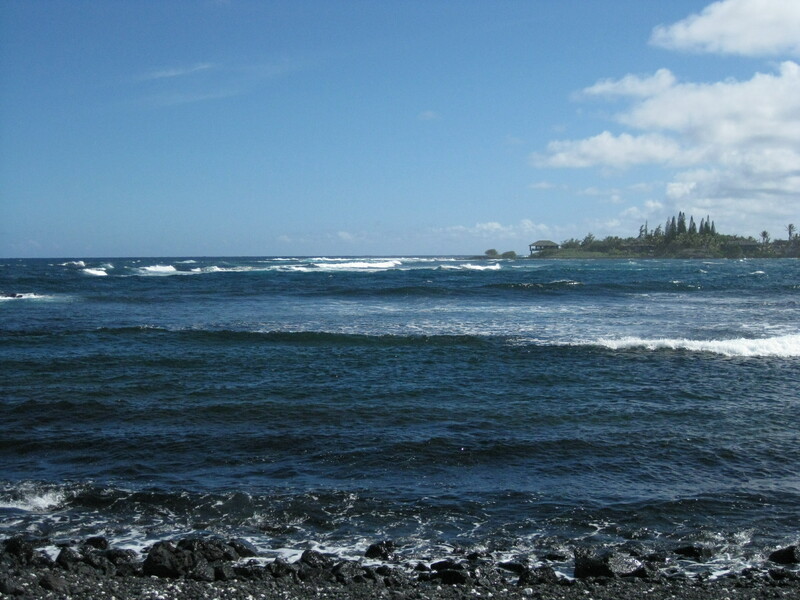 Kapoho. 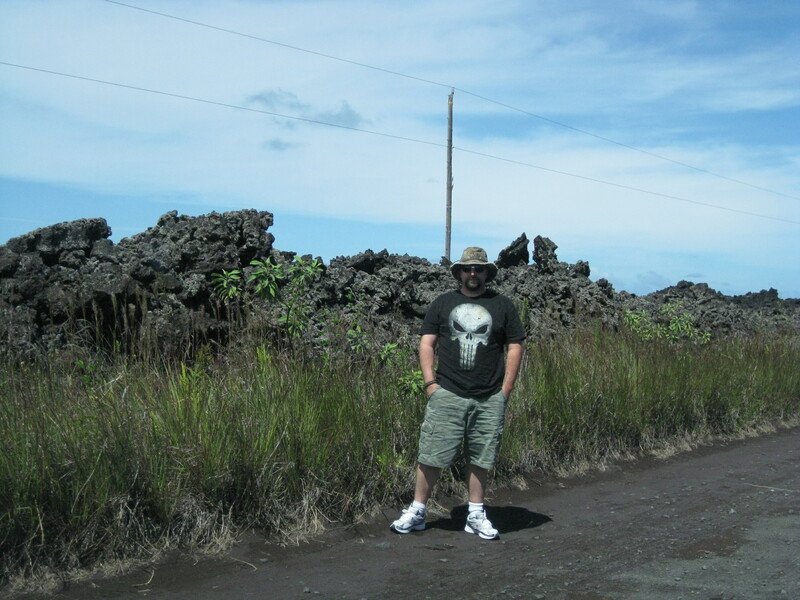 Carl by the side of the road….the lava over his head in some places! 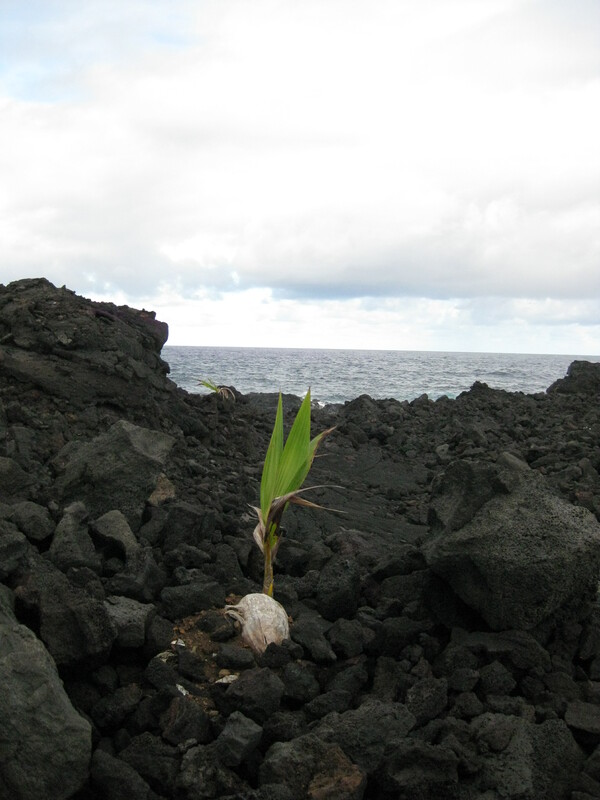 As we drove through the lava field, we had a hard time imagining that amount of destruction…even though we were ON it. As far as we could see, all the way to the ocean, had at one time been flowing lava. I learned that flowing lava has an average temperature of over 2,000 degrees which is hard to comprehend in and of itself. But to look over the expanse of all of this destruction is unimaginable. We’ve experienced the wrath of mother nature before. We lost a good chunk of unimportant things to Hurricane Katrina…but this is different. With the hurricane there was evidence of what was there before the disaster…with this…it was just a never ending vista of black rock that buried an entire town. However, I digress. 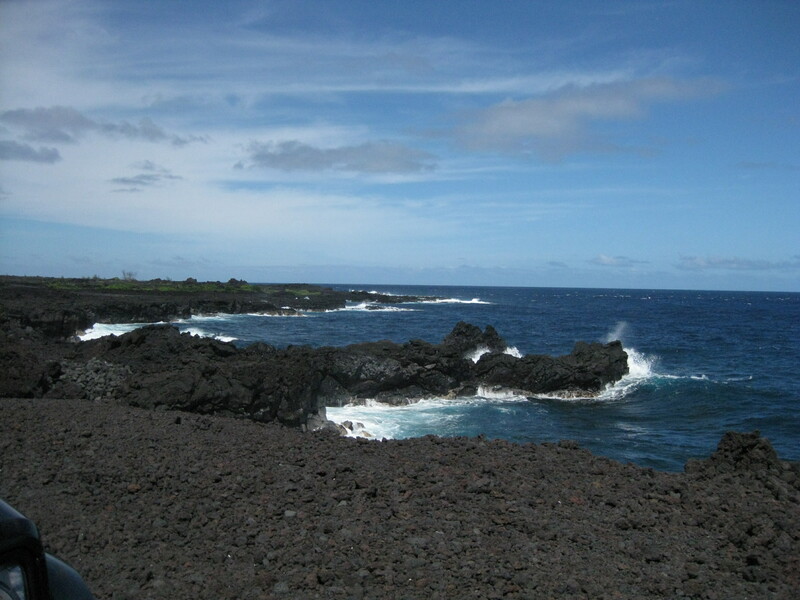 At the coastal end of this lava field is another mind blowing thing. The purest air in the world. I read that the air on this point is so pure that it’s called “virgin air”. The landless Pacific blows in air that is considered as pristine as any in the world, and it is used as a benchmark for air purity around the world. We stopped to take a good deep breath (or two) and enjoy being at what felt like the edge of the earth. 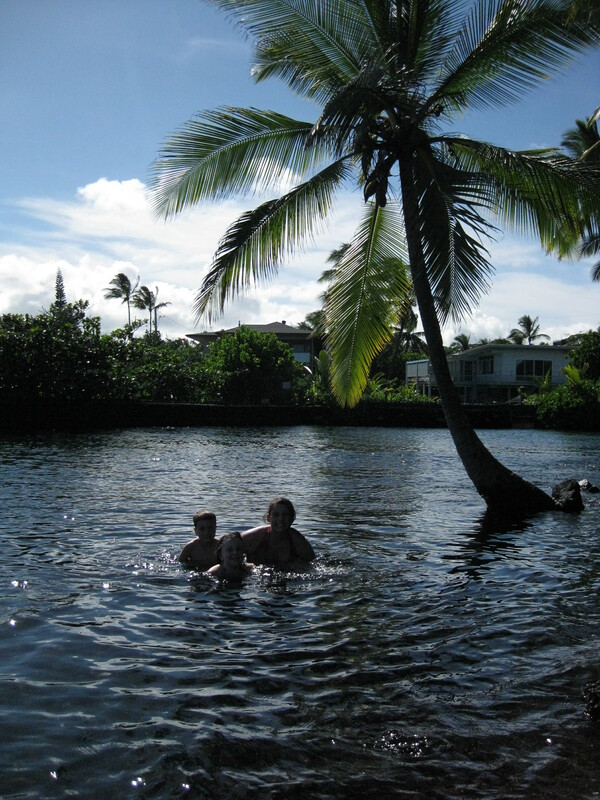 kids under a coconut tree in a volcanically heated pond! 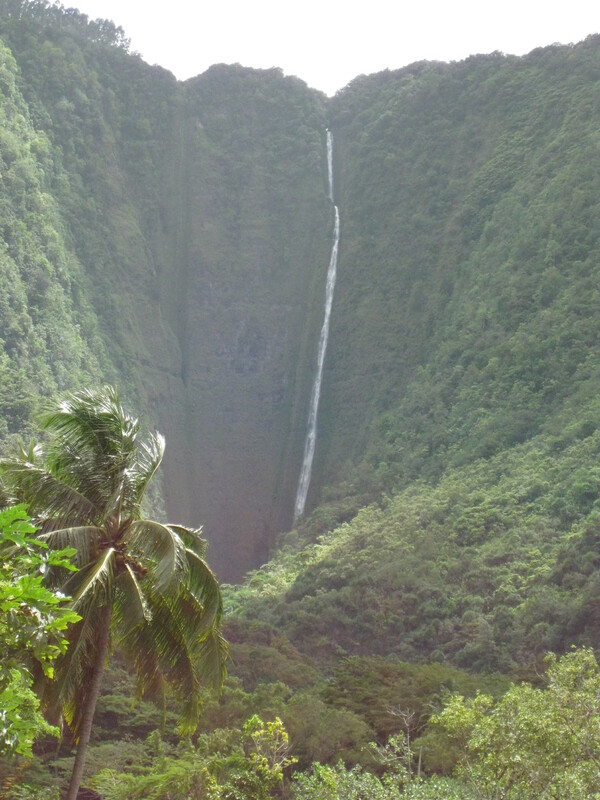 So far our trip to the Big Island has been magical. I have a ton more photos to put up and share with you all. But for now, I’m heading to bed….gotta recharge for our snorkeling day tomorrow!! Mahalo for stopping by and I’ll have more for you soon! ps. if you are interested in more detailed information or directions to anything we share, please don’t hesitate to ask!